Since starting to juice, I juiced 6 times last week and feel infinity better for it. My cravings for things like fries are significantly better, still there but manageable. I don’t have an actual juicer, so I add water and blend everything in my vitamix then pour it thru a nut bag. It makes the juice a little less strong and I am enjoying that at this point in my juicing career. My favorites have been, green apple kale juice with I make with a green apple and 4 or 5 leaves of dragon kale. I also make one with carrots, chard, and a Fuji apple that I enjoy. On my quest to not eat the same foods all the time, I tried two new recipes this week. Marinated mushrooms and banana awesomeness (I am not sure of the exact same, but I love it so that is what I named it.) I found banana awesomeness on youtube. 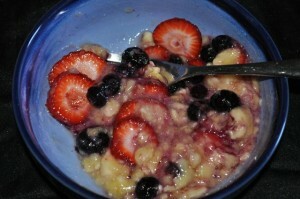 It is just mashed banana with a little agave, a couple sliced up strawberries, and a handful of frozen blueberries. It also calls for a little lime juice. It is really good. The marinated mushrooms, are baby bella mushrooms left in olive oil, nama shoyu, and fresh minced garlic. So yummy. Juicing so far has really seemed to cut the cravings down to an annoyance instead of an obsession. I am sleeping great and wake up ready to go. I have a ton of endurance as well. For example, the other day at the gym, I decided to try the stair machine that mimic a short escalator. Now, I typically don’t have an issue doing a few flights of stairs, but I am not usually in situations where I need to do a lot of stairs. I did 25 flights of stairs on the machine, and still had energy to do laps for a while. I did not have to stop once. This did workout did not slow me down at all. It just felt good. 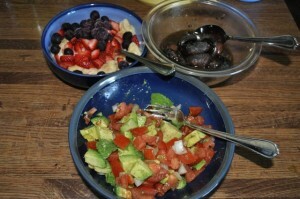 This entry was posted on Wednesday, September 23rd, 2009 at 10:53 pm	and is filed under Raw Food. You can follow any responses to this entry through the RSS 2.0 feed. You can leave a response, or trackback from your own site.